White Crane is proud to feature two homes during the 2017 Fall Parade of Homes Remodelers Showcase®. Stop by our two remodeled locations, R53 in Minneapolis and R56 in St. Louis Park. Talk with the White Crane Design:Build team about their Showcase projects or chat with a designer about your own remodeling dreams. Harmony by Design. 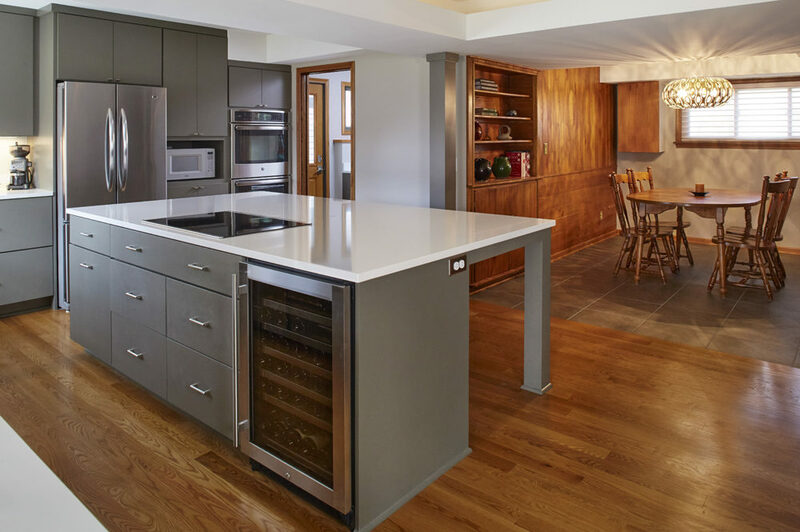 Our client wished to transform their South Minneapolis home to create a space for entertaining family and friends. To achieve this, a wall was removed between the kitchen and dining room to open the space. The remodeled kitchen features heated tile floors, quartz countertops, and glass tile backsplash. In the Lower Level, the laundry room was relocated, recycled kitchen cabinets became a bar, and the powder room was upgraded to a 3/4 bath. Upstairs, the owner’s suite was reconfigured, and floating vanities were added to the master bath. See more information and photos for this project. This home was brightened by opening the entry, raising the ceiling, and removing a closet, making room for a new custom bench and front door. The kitchen features oak hardwood floors, gray cabinets, modern lighting, and white quartz countertops. The laundry room/pantry has a new luxury vinyl floor, adjustable shelving system, and cabinets matching the kitchen. See more information and photos for this project.